A French composer born November 7, 1960 in Sétif in Algeria. Born in Algeria to a Polish father and French mother, Pascale Jakubowski studied music in France. Following a double cursus – piano then clarinet – to which was soon added singing, she had already over several years written works she had frequently performed herself when she undertook to follow, in 1986, classes for harmony, electro-acoustic composition and musical analysis at the Bordeaux Regional Conservatory. From the start Jakubowski enjoyed the joint practice of composition and interdisciplinary experimentation, and this frequently led her to work closely with artists and scientists (Trans-figurations and Télé-plastique, 1989-1992; Le destin de petits riens, in a visual environment by Francis Proudhom, 2005). This came from a sensitivity to other forms of artistic expression, and these came to being within an atonal discourse free of any systemic rigour, in which the exploration of micro-intervals and a multiplicity of instrumental modes of play were also able to flourish. An artiste in residence in Ille-et-Vilaine (1999-2000), Jakubowski developed an ambitious project within which one can find the constitutive elements of her compositional approach, such as literature and world music, these latter always having deeply nurtured her thought. Rewarded by the Sacem in 2005 (Pierre and Germaine Labole Prize for Hautes Terres; 2004), the composer held successively various teaching positions. Since 2007 she has been a teacher of analysis and composition at the Saint-Étienne Regional Conservatory. Sauf mention contraire, les partitions de Pascale Jakubowski sont diffusées par Art et Recherches. Création : 15/12/2012 – Ensemble de jeunes voix Aposiopée, Ensemble instrumental Unissons, direction Jean-Louis Vicart. France, Paris 10ème, Espace Jemmapes. 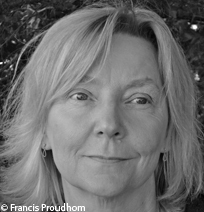 Création : 22/08/2014 – Laurence Bourdin. France, Polignac, Forteresse. DELMER Francine, JAKUBOWSKI Pascale. Sous tes pieds les étoiles. In : Rencontres entre artistes et mathématiciennes : toutes un peu les autres / à l'initiative de Femmes et mathématiques ; [réd. par] Thérèse Chotteau, Francine Delmer, Pascale Jakubowski... [et al.]. L'Harmattan, 2001, p. 133-155. (Bibliothèque du féminisme). THELOT Jérôme, VERDIER Lionel. Le haïku en France. Éditions Kimé, 2011, 314 p. (Les cahiers de marge).